Last month I was busy with the OS- Ubuntu. And I was also busy flaunting how superior my OS looks! It is not that big a deal, yet I feel I should have posted these screenshots a few weeks ago. Oh well, no hurry! I thought of scribbling why I prefer Ubuntu to Windows, but that has been talked about already by a lot of people and am still an amateur. Less than a amateur really, if that is even possible. Perhaps, I'll post on it some other day. I can happily say that I have stopped using The Three Finger Salute (CTRL+ALT+DEL) :and life is easy without the need of any Anti-virus software. Click to enlarge the screenshots. 1) Never be spiteful. It kills! 2) Expect less from people around you; they'll surprise you with something special! 3) Forgive. It makes one feel GODLIKE ! I will not recommend you to thank everyone you meet as everyone has read "You Can Win". Now, it is difficult to know if people are being genuine in their comments! 4) Peace! As a friend of mine always keeps saying, "Make Music, not War." 5) People around can be down, disgusted and depressed. Just listen to them with your ears open, that will do. Don't pretend. No sympathy. Just listen! 6) Keep challenging yourself with something or the other. You can always surprise yourself. It is easy. And yeah, I thank all the readers who unglued me from the T.V. Had it not been for you guys, I would have never thought about writing. A special note of thanks to Neeru and Srinath who consider writing as a constructive hobby. No, am not here to recommend you a long list of must-watch-movies, nor am I here to give you my never-ending list of favourite movies. The title gives you a clue! It is very rare that we hate a movie first, and then after a while, after having thought about it, after pondering over the unconnected pieces, after having watched it again, we begin reconsidering our views. And finally we land up watching and enjoying the movie for God knows how many times! 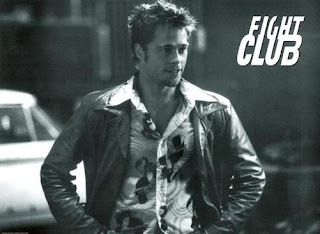 Two such movies are Fight Club and The Prestige. The former, being highly controversial for its satirical nature and obscenity, is one movie with the most memorable quotes. Though the movie is a complete opposite of a fairy tale and is dark in many ways, it is very new and I must admit that the crew must have had some crazy time on the sets! A true classic for having broken many grounds. I cannot write more on the movie as the suspense will be revealed! I must warn you though, that certain parts of this movie are very disturbing. 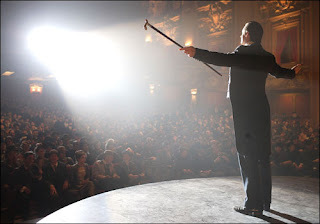 The Prestige, a movie by Christopher Nolan, is a mystery with a lot of magic in it. As always, Nolan with his inclination to unconventional, non-linear story-telling, leaves us spellbound. The portrayal of the characters is truly amazing having depth in them; and it is difficult to judge who is more wronged and whose actions are justifiable to be pardoned. The movie, with its catchy prologue and a brilliant epilogue, has to be watched very carefully. A rare treat and definitely an underrated movie. As Caine puts it in the beginning- Are you watching closely? NOTE: Not for those few who live in a fairy land and certainly not for those who are easily offended. Selfishness is an attribute that is common to all of us. If we don't agree, we are simply deceiving ourselves. Every living soul is selfish. The perspective of people with regards to the word differs and yet I stay with my viewpoint- 'Every living soul is Selfish'. My writing a post on selfishness reveals a certain degree of selfishness. I write this particular post with a belief that a few people read and notice it; and out of the few, maybe a very few even appreciate it. There lies my selfishness. Crazy me. Why are we humans dominating this world? Humans are the viruses who love multiplying and if possible, take control of everything that is considered matter. There lies the selfishness of humans as a whole. We are ready to shift places to study, to work and to move on in life. There, again, lies our selfishness. We are ever ready to score the best grades possible leaving no chance whatsoever for the not-so-intelligent lot. No, that is not selfishness. That's how differentiation works. Most of us, in short, are pretenders who pretend that we aren't selfish. The first argument you'll chuck at me is- 'What about all the social workers and the Mother Terasas out there!' Tricky one. Well, they are/were fed up with the happenings around them. Chances are that they sat for a while and analyzed the world as it exists and devoted their lives for the better being of lesser fortunate people. They felt they would make a difference. A sense of selfishness still exist in that that they wanted to feel better and some wanted to set an example for the posterity to follow. "I (WANT TO) feel better helping others"- truly selfish with a sense of selflessness. Selfishness, which of course, is exempted on the basis of being good. Simply admitting that everyone is selfish makes the adjective lose its inherent value. True. Selfishness isn't atmospheric pressure to be measured using a barometer, not at all; yet we have certain degrees of selfishness- a little selfish, very selfish, extremely selfish, etc. I still don't like the way the world is moving. So rapid, so very confusing. And please don't tell me all those- "Nature is Beautiful and Wisest of all" stories. The place I live in, from my room, I see a tree outside my window crying every time when rain pours. So strange is the world and the people who live in it; there is one group trying to save Mother Earth, in vain and the other trying to destory it! We have also mixed Science and Religion and made this world so uncomfortable to live in. Is it uncomfortable? I am comfortably sitting here, no doubt, but what about the millions who are being miserable and ill-treated at this very moment! I cannot be sure, for history reveals that misery has been a part of our world right from the very beginning. But again, history is written by us humans. State of Devaju- I think I already discussed this. We humans can love. Love and Selfishness sound very bad together. May they get betrothed. Yes, we are selfish, but we can love as well. And love is more powerful a tool than any other. Being selfish is different from being spiteful. And being selfish is definitely different from being egoistic. Why get annoyed and agitated at people being selfish! Not always necessary. So, next time someone tells "You are Selfish", smirk and give a sneering look, and then tell them to go see their-selves in the mirror. People who live in places with glass windows shouldn't try to break the windows of their neighbours! We are imperfect and that is the beauty of us, Humans. Though we are dark, there is room for light. Ah, it is morning already! I, Nitin, a selfish fellow dedicate this post to a not-so-selfish, dear friend of mine. The first line is taken from a song from Twain.. Loves his breakfast, lunch, dinner and food. He hates it when people fight. For that an MP3 player he bought. And wooing her he'll never tire. And for her, he'll commit that one coveted Sin. 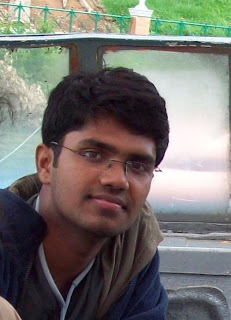 My friend Vignesh, the Iyer. Vignesh asked me if I would write anything at all on him. Dedicated to Vignesh, a great friend. 1) Those who wear white clothes. 2) Those who wear a single piece of cloth. 3) Those who restrict themselves from any form of clothing whatsoever. *Nuns belong to the first category and are mostly in draped in white saree. *The terminology of the three categories is not mentioned(by me)due to the complexity of their pronunciation and also the spelling. 2)They take food only once in a day. It is a strict practice. They cannot use dishes or sit comfortably on a dining table. They stand, stretch their palms, and someone(usually followers) offer them food. The saints check the food offered very carefully before they consume it. If they find germs, dust or anything displeasing, they leave the food at that very instant and remain hungry till the next day. 4)They often take 'hunger vow'; no food for the day. Sometimes, this hunger vow continues for eight days straight.It is said that the great saint of twentieth century, Acharya Shantisagarji maharaj had a total period of twenty-six years of hunger in his life span of seventy years. 5)They do not use vehicles for movement. They travel on foot. And they walk faster than us! As they refrain themselves from using any means of transportation, they remain in our country. 6) They do not use beds, sleeping bags, bedsheets or rugs. They sleep on wooden planks or wooden cot with a mat on it. During sleep, they do not change their side with the thought that germs moving around might get killed. 7) They do not speak after sunset. 8) They are not expected to involve themselves in any worldly matters. d) A pair of spectacles, if necessary. Money and other valuable things are of no concern to them. 10)They are not supposed to get angry- even to a person who blames them for something. 11)They don't drink water throughout the day. They have a fixed(not permanent) time for drinking water too; and they drink water only once in a day. 12)Shaving, haircuts are not allowed. Everything is done with bare hands(without the help of even a pair of scissors). Ha, a lighter note this time, certain observations! 2) A moment is best enjoyed when it is totally unexpected. 3) Start sharing your worries and miseries. It makes you feel good, still wondering why though. 4) Just let your "Oh hell, what next!" emotion drive you crazy. 9) "Garfield" and "Calvin n Hobbes" bring a smile to many a face every morning. Happiness is contagious, please don't pretend to be immune. ;) Read them,enjoy ! 10) Randomness, if not the best, is another way to put things in order. My first post during the day. happy holiday everybody.